Their best picks were of Shimron Hetmyer and Shivam Dubey. Also Henrich Klaasen was a steal at a base price of 50 lakh. Gurkeerat was also a good buy as he has experience of playing IPL. They have made a team that is capable of lifting the IPL trophy of they played as a team and with a winning mentality. He keeps wicket for RCB and is a better powerplay player. He is able to give a decent start to RCB while chasing big scores or to impose big scores. He is able to score 20-30 runs in every matches in powerplay with better strike rate. This will contribute a lot to the team. He has always been a best performer for RCB alongside Ab de villiers. The captain kohli is in tremendous form since 2-3 years. He is better in #2 than in #3 as per the stats so i like him to open the innings. He is a great opener in IPL as we have witnessed in the past. He also provides a great start and great thing about him is that if he stays in the crease for long time, victory is sure. I am putting Hetmyer infront of AB because this allows him to play a natural game. If he comes after AB then he should strike the ball and also not lose his wickets which he is not experienced of. This will put him under pressure and mighy fail miserably. But if he comes at #3 then he can play with not much pressure and play his natural game because AB is yet to come. We have seen him performing well in CPL and also against India. Though after auction his form is not so good and trolls of RCB is everywhere, I believe he has the potential to play a great cricket and after he gains some experience he will be the player to watch out for. He will also help in solving our middle order woes. Mr. 360 will anchor the innings and clear the ball out of the park if needed. His playing at #4 is very essential because he is the only one player we can rely on after Virat Kohli. He can also play the role of finisher if wickets of upper order falls slowly and he enters the arena on around 16 overs. So I like to see him playing at this position and also another benefit of AB is that he will be playing IPL whole season while other SA playets will have to leave at the later stages of IPL. He has played IPl before representing KXIP and he is a decent allrounder. He can provide stability if the wickets falls down rapidly and he is also capable of bowling 1 or 2 overs since he is an allrounder. Player of his caliber was lacking in RCB in previous season but fortune might have changed for RCB this year. You can check the link to watch his brilliant fielding and batting of Gurkeerat. He is a valuable player in our team. He can bat well, bowl well and field well. He will be playing the role of finisher in batting and also he can provide breakthroughs with his slower ones as he did against India in recent T20 series. He is an underrated allrounder in my view . He has played very crucial knocks for Australia as well as in IPL but he isn’t sought after player. He will add a tremendous value in RCB lineup. After his departure, Colin de grandhomme can replace him in the lineup . Many RCB fans have already known him but for those who hasn’t heard his name, he is a player who has hit 5 sixes in an over twice recently. He was picked at 5cr. Being an uncapped player from Mumbai, he has potential as of Hardik Pandya. If he uses his potential to the fullest, he will making a spot in Indian team soon. RCB has always lacked a proper Indian finisher but Shivam Duvey might solve that issue too. He is also a handy bowler in addition to his powerhitting abilities. I prefer Coulter Nile over Tim Southee because of his raw pace and wicket taking abilities. He was the one who played crucial role in the dismissal of RCB team at 49 runs. He can pick wickets early in the powerplay which is just crucial for a him to make lead in the initial stage over opposition. He will be the dark horse of RCB and will be our death bowler. I hope he will not be injured again. He was in a tremendous form last season pick two or three wickets within an over. If he shows same form this season then RCB’s bowling attack will be a lot stronger. I think Virat kohli should finish Umesh’s quota of four overs under 12 overs. This way he will be much effective in bowling. He is our another death bowler alongside Coulter Nile. He can clock above 145 kmph and can take wickets in death overs. He played very crucial role last year and I hope the same from him this season too. If this Playing XI performed well they should stick with it and shouldn’t chop in and out as it affects the team balance as well as player’s mindset. 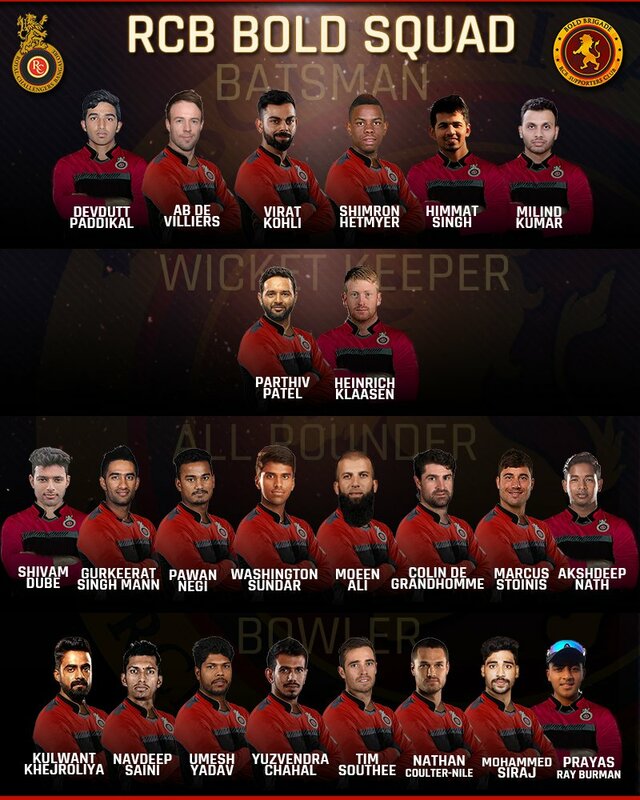 This XI has 4 proper batsman ( including wicketkeeper), 3 allrounders and 4 proper bowlers i.e 7 batsmen abd 7 bowlers . This type of abundance releases the dependency on particular player. If somehow this XI doesn’t perform well then they can play gurkeerat at 7 and Shivam dubey at 5.